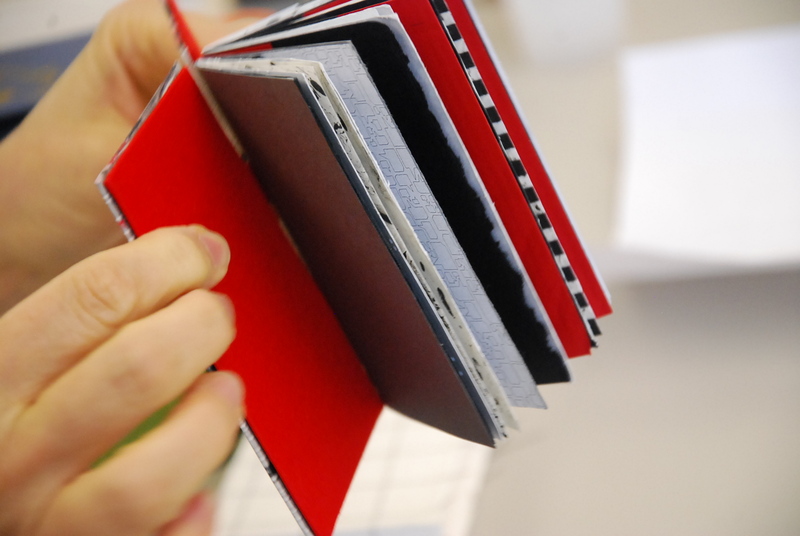 Art Book Binding. What Is It and Why in Oaxaca? Back story: A few years ago, I had the pleasure of helping Warren Wilson College art professor and author Gwen Diehn assemble her handmade books at the Asheville BookWorks in Asheville, NC. The National Museum of Women in the Arts awarded a grant to Gwen to do the book design, woodcuts, typesetting, printing and bookbinding. It was fun and relaxing to gather around the table stitching the papers together with a group of enthusiastic people. Many of us had no experience doing this and we were there to support Gwen and to learn. Photos above illustrate the coptic stitch technique in a class I took recently taught by Lisa. I love this traditional bookbinding art form. The experience I had with Gwen & Company triggered the idea of organizing a book making workshop in Oaxaca. We will start with a visit to San Agustin Etla, a local village known for its handmade Amate paper studio started by Oaxaca artist Francisco Toledo. There, local and international artists create books, journals, jewelry and kites made from this material. When I enrolled in two art bookbinding workshops with Lisa, I discovered what a joy it is to learn from her. Lisa’s style is gentle, affirming, and encouraging. She provides in-depth learning materials, diagrams, and instructions. She is a coach, a mentor and colleague in the book making process. And, she supports people who are beginners who want to learn the craft. Our process in Oaxaca will be to select the papers, fold them and assemble our signatures, stitch the signatures together with the cover, make the box, and add embellishments. What you put in the book is totally up to you — you can use it as a journal, a sketchbook, or any combination of visual or art journal to capture your travel adventures. We hope you will make plans for August 2012 to join us in Oaxaca for this very personally satisfying art book binding and travel journal making adventure! Here is Lisa’s Bio: Lisa Gilbert has been an enthusiastic book artist since childhood. She has been illustrating professionally, and teaching art and/or health for the past 20 years. Known for her use of color, finely tuned creativity, and excellent technical bookbinding, Lisa has been invited to show her work in two North Carolina exhibitions. She has studied bookbinding, paper making, and box making at programs across the U.S., and most recently completed a Penland School of Crafts program. She has taught bookmaking classes throughout North Carolina, and has a reputation as a patient, encouraging, imaginative, and effective teacher. Lisa considers herself to be a “cultural navigator” – a well-deserved designation since she has traveled to more than 25 countries. She purchases, collects, and uses exotic papers on her travels, most recently from Panama, Scandinavia, and India. Lisa has visited paper making facilities and bookbinderies across India and has fashioned books from wood, papyrus, metal, mica, fabric, plastic, vinyl as well as from traditional materials such as handmade and machine-made decorative papers. She attended Colorado Institute of Art, holds degrees in art and business, and the PhD in health education from University of Maryland. Her background is versatile and inventive.